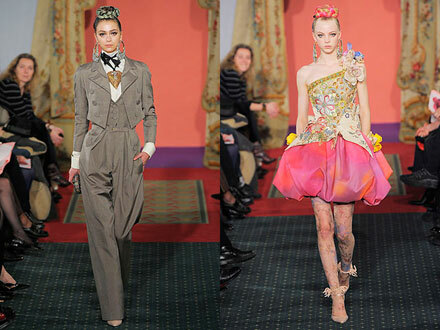 As I’ve told you before Christian Lacroix filed for bankruptcy last month seeking protection from the creditors. A friend in need is a friend indeed, people say. One of the house’s devoted clients offered her help to rescue the label but the designer turned down her offer and refused to take the check. Lacroix owes $1.7 million and has been working for free for months, it was revealed. The factory employees haven’t been paid either. So it’s more than probable that his Fall 2009 collection will never hit boutiques. The house’s attempt to cut cost by buying cheap materials for their low-priced Bazar and Christian Lacroix Jeans lines hasn’t helped either. So the management decided to cut them. However, in spite of the pretty gloom future, famous designer claims he still designs for seamstresses in his atelier. What a wonderful man! It’s so, so sad. We have mediocre lines by Heidi Montag, Lauren Conrad, Paris Hilton and the like, but lose haute couture, “quality” fashion. No bitching, life is so unfair sometimes.